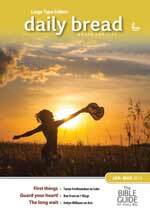 Daily Bread (Large Print) is the Bible reading guide that aims to help you hear from God as you read the Bible. If you've ever asked the question, 'What possible relevance can this verse have for me today?' or 'What difference does this passage make to my life?' then Daily Bread is for you. Daily Bread is the Bible reading guide that aims to help you hear from God as you read the Bible. There's three months of dated material that provides real inspiration each time you read it. This Bible Reading Guide is available for purchase as a single copy every quarter for $16.95 plus postage.